Three perfectly crafted Venetian masks inspire passion and scandalous love in whomever dares to wear them at the mysterious and exclusive Masquerade of Venice. Italian for three, Tre follows the journey the three masks take through the centuries. First bringing together a Venetian courtesan, a rich nobleman and a valet in a salacious affair that will leave nothing to the imagination. An affair that scandalized even the most licentious citizens of the city. The masks surface again in the last days of the Victorian period. An heiress, her neighbour and a mysterious woman disguised as a man take up the masks and find themselves drawn into a passionate night. With no curiosity unexplored and no fantasy unfulfilled the three find untold pleasure in the freedom of anonymity. Within the household staff a maid and the steward embrace their own passionate desires and embark on a love affair that reaches through the centuries. In the present day, the masks are brought together once again despite over one hundred years of separation. A Dominant and submissive couple in a complicated and failing relationship and a twice scorned modern day Casanova with a luscious English accent are swept up in the undeniable urges created by the primal magic of the antique masks. A night at the Masquerade is all that is required to unleash the sensual promises imbued in the plaster and gold. 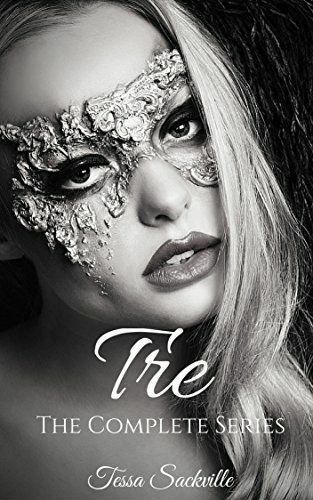 Arousing and fearless, Tre will take you deep within the corners of the mysterious city of Venice and unfold for you a sweeping tale of romance, secrets and forbidden fantasies.